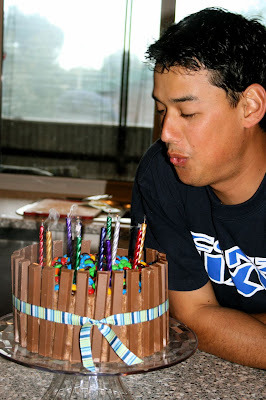 make it perfect: .fun birthday cake. I saw this brilliant cake on Hostess with the Mostess blog a few weeks ago and have thought I would have to wait a few months until the next family birthday came along so that I could make it. Then I found out that our adopted brother Mandi's birthday was today so I keenly offered to be chief cake-maker! I am a big fan of birthday cakes that do not require sculpting, icing smoothing and wastage. Super quick and easy. I underestimated the amount of Kit Kats that would be needed to cover the sides and think it would have looked much better with a few more so there weren't any gaps. Such a great idea and could easily be adapted using lots of different types of lollies and chocolate. And here it is in action...Happy Birthday Mandi! oh YUM!!!! That is THE best birthday cake!!! LOVE it. I must make that cake. I LOVE Kit Kats! ohhhhhh wow.... 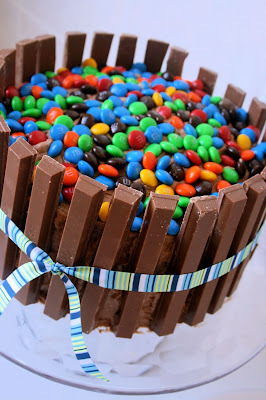 I am hoping to have a candyland party for one of the boys next year and this cake is beyond perfect...... so awesome!! Yum, this is my sort of cake! awesome cake tone. looks delish!